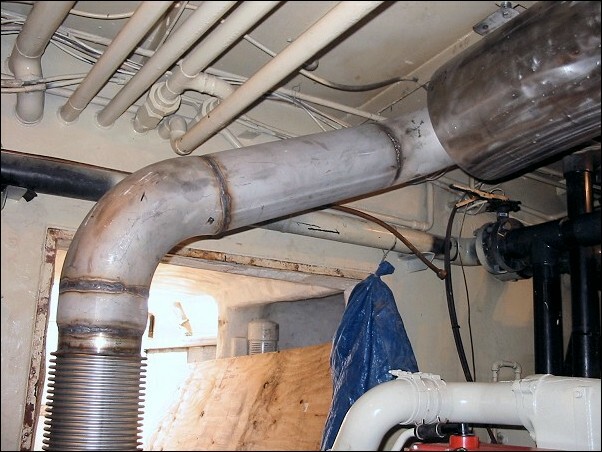 Dry exhaust systems are not very common in the typical marine vessel used in recreational service. There are many reasons why you do not see them although, in many cases, they do have desirable features when designed and installed correctly. 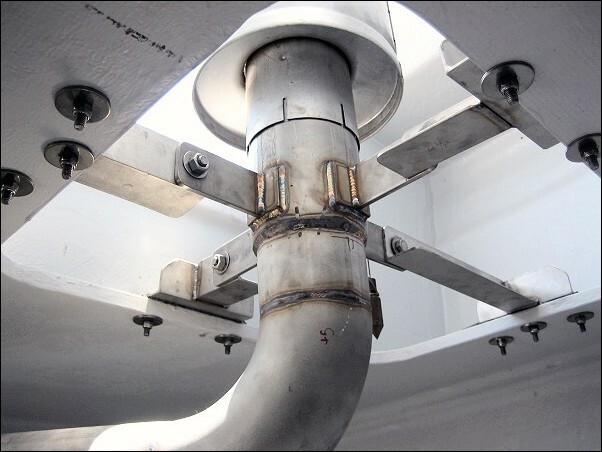 A dry exhaust system can add considerable costs, is usually more complex as to proper design, fabrication and installation, and can be a dangerous fire hazard if the design and installation is not 100%. What many operators and builders DO NOT understand is the approx 1/3 of the total energy (heat) that comes from the fuel that is consumed by a diesel engine is expelled as heat thru the exhaust system, and this heat must be contained and then exit the vessel safely. 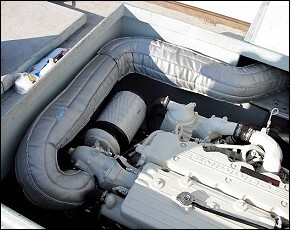 With a water cooled exhaust (wet systems), controlling and dissipating this heat is much simpler. Commercial Fishing Vessel “Ocean Pearl” – Images above show shop construction, layout, and pre-assembly is time consuming but it’s the only way. This “dry system” took about 60 man hours to design and fabricate. 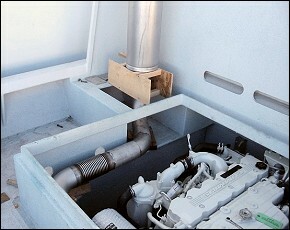 Images below show support brackets and installation. The under deck installaion took about 2 hours. 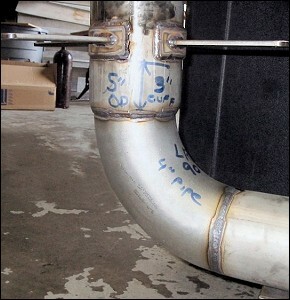 1) The use of stainless steel through-out the system when practical. 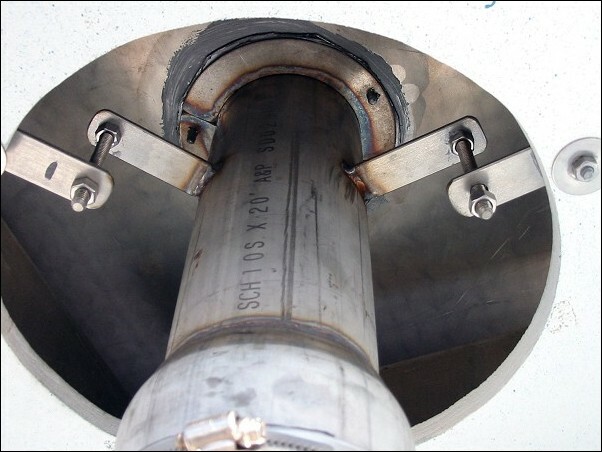 304L & 316L series stainless allow the use of lighter weight sections because it is not subject to the corrosion effects of diesel exhaust on the inside or corrosion on the outside from salt laden air. 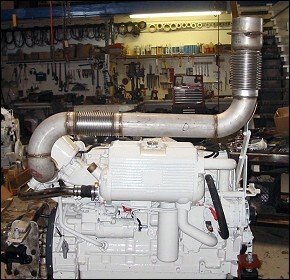 SS can operate at the continuous temperatures in the 700F to 1300 F range that diesel engines exhaust produce without losing strength or scaling. SS can tolerate these high temperatures without being cooled by large external air flows that trucks and other non-marine applications have. 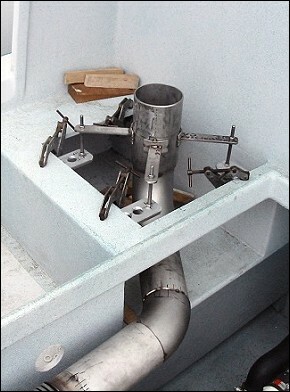 Commercial Fishing Vessel “Saint Peter” – 28 Ft lobster vessel powered w/ a Cummins QSB. Images above – we had limited space but worked around what we had. 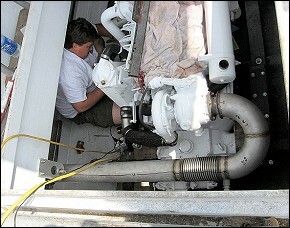 We only had to “wrap” under the deck because of proper “drafting” of the muffler compartment. Images below show lower muffler support and our “unique” type of muffler supports that not only give a lot of adjustability but transfer close to zero heat to the nearby attachment surfaces. “Top hat” and upper stack that employs the same features. Expensive and time consuming to design and fabricate, but this is one place you DO NOT want to cut any corners. 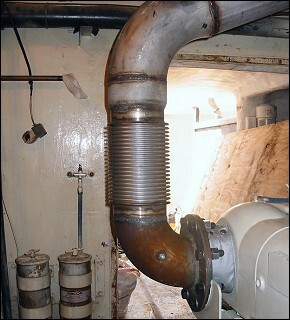 2) Un-cooled exhaust piping “moves” or expands and the use of flexible “bellows” is mandatory. We use SS bellow made of 321 SS at it has shown to give long term reliable service in demanding high hour commercial application. 3) Under the deck is where most care must be taken as to spacing and supporting or “hanging” the system. You must allow enough space to install proper insulating blankets or covers and all support brackets must allow a minimum of heat transfer to the adjoining surfaces. 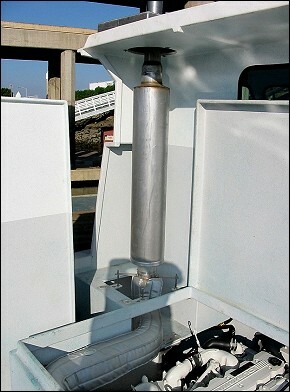 Cummins N-14 in the 75 Ft commercial seiner “Anthony G” with 5″ dry outlet to 6″ bellows and muffler. 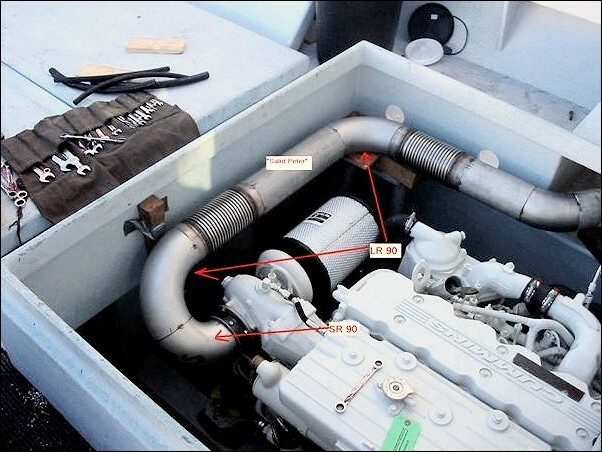 4) Once the exhaust exits the deck and is now in the typical “muffler” compartment above the deck, the use of natural “drafting” from the heat is critical to safety. Ever wondered why the stacks on ocean liners are so large on the outside? 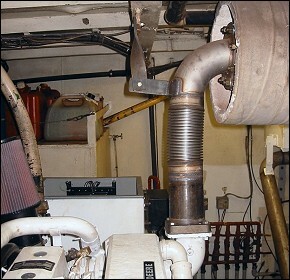 That’s because they use the heat that goes out the exhaust to “draft” the internal piping and engine room – just like a chimney, the heat draws excess air thru it. 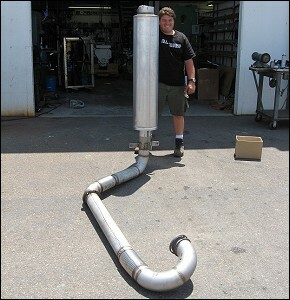 5) Dry mufflers are large, heavy, can be quite cumbersome to deal with, and get extremely hot. 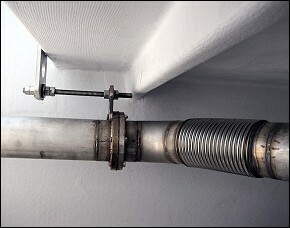 The bracketing to hold and support a muffler on a vessel must not only be strong, it also must not transfer heat to the surrounding support surfaces. 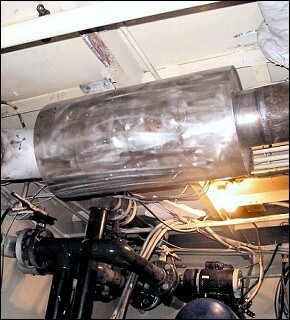 We always leave plenty of room in this area and allow the use of draft air to cool the support brackets. 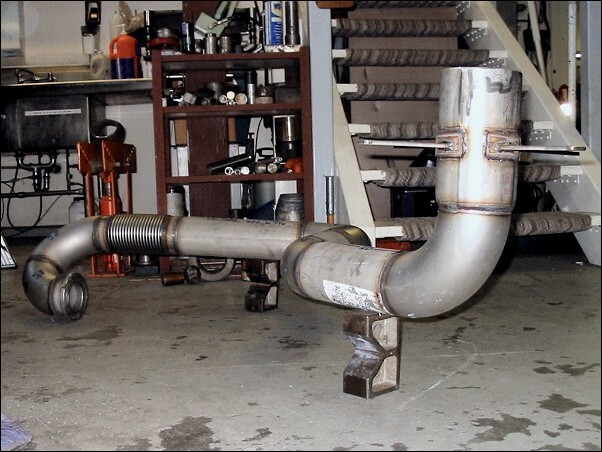 If the muffler compartment is large enough and well drafted, then using an insulating blanket around it is not necessary as the draft air becomes the insulator. But since each design is different, this is now an option based upon the uniqueness of the overall installation.